The IMF calculates the Kingdom of Sweden’s gross national debt to GDP ratio at 41%, but its net debt to GDP ratio as 9% at the end of 2017. However, the Swedish national government reports the country’s debt as being 29%. The difference is because the official figure reported by the government includes only those debts that are covered by investment instruments, such as bills and bonds. The IMF figure includes much more, including guarantees for loans to other organizations, local government debt and the debts of state-owned utilities. There are many different ways to count a country’s national debt and the Swedish government uses the “non-consolidated central government debt” model. Other countries cout “general government debt” and their national debt. This figure includes the debts of all of the public sector, no matter how those debts were financed. Another key surprise in the IMF figures is the big difference between gross debt and net debt. This means that, while maintaining debt, the government also has a lot of assets. This is probably caused by the government integrating the accounts of the state pension system into its books. When the fund was run as an independent organization, it included assets, mainly in the form of financial instruments, to fund payments to pensioners. By the Swedish government’s narrow definition of debt, it does not include the obligations to pensioners, but it does include the assets of the pension fun in its net debt calculation. How did Sweden’s national debt get so low? The government of Sweden has made a concerted effort to reduce its own debt, thus lowering public debt as well. In 1995, the central government debt to GDP ratio stood at almost 80%. The integration of the state pension system into the government accounts gave the central government access to a large amount of savings, much of which was stored in government bonds. The government used some of this fund to pay off part of the national debt. It also sold off state-owned enterprises to rise money for debt reduction. What is Sweden’s credit rating? The table below shows the opinion of the top three scoring agencies on Sweden’s credit rating. Very few countries in the world have a triple-A credit rating. This is one of the main reasons that the government of Sweden does not have to pay a high interest rate in order to attract traders to buy its bonds. The most recent long-term bonds issued by the government of Sweden boreand interest rate of 0.39%. However, the low interest rate is not solely based on the credit rating. As a comparison, Mexico, which has an A+ rating had to offer an interest rate of 7.25% on its most recent issue of long-term benchmark bonds. Who is in charge of Sweden’s national debt? King Gustav III of Sweden set up the Swedish National Debt Office as the Riksgäldskontoret in 1789 to raise funds for a war with Russia. The country already had a central bank, the Sveriges Riksbank, which is the oldest central bank in the world. Although the central bank was originally created to raise money for the governance of the country, its rules stated that all bill issuances had to be backed by silver. The King wanted to raise more money than his silver stocks would allow, so the creation of the Riksgäldskontoret enabled him to source funds backed by nothing more than the reputation of the Kingdom of Sweden. The Debt Office is answerable to the Ministry of Finance, which appoint’s the Office’s Board of Directors. Does the Swedish central bank sell debt? Answerable to the national parliament since 1989, the National Debt Office is still responsible for raising funds for the government through debt, while the central bank retains responsibility for managing the currency. 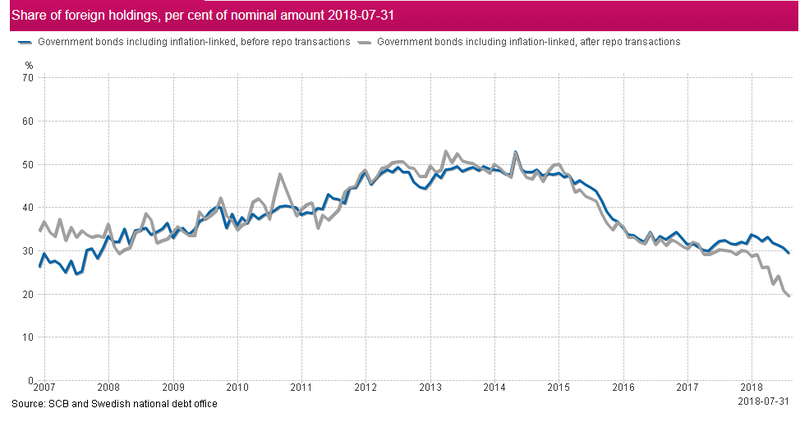 Although the Sveriges Riksbank is not responsible for selling debt, it does have observer influence and has to take into account the actions of the government and the National Debt Office when it sets interest rates. Also, the Bank overseas secondary debt markets and is allowed to buy Swedish government debt. The Swedish National Debt Office is active in a number of markets. The table below shows where all of Sweden’s national debt was sourced. Most of the activities of the National Debt Office are denominated in Swedish Krona. A Treasury bill does not pay interest. However, it is sold at a discount and redeemed at face value. Treasury bills have a maturity period of one year of less. Commercial paper refers to cash management devices that are used a little like a private individual would use an overdraft to make payments a few days before expected income arrives. The derivatives market is a little complicated, but the National Debt Office has about SEK 4.5 billion in financing through these markets at any one time. The government runs a national savings bank. Members of the general public deposit their savings and the bank pays them interest. The National Debt Office uses these funds for short-term financing. The standard bond, or “benchmark bond,” provides the largest source of funds for the National Debt Office. The government owes almost three times as much through this type of bond than through its inflation-linked version. A benchmark bond is issued for a maturity that is a year or longer and pays the same interest rate every year. At the maturity date, the Debt Office pays back the amount that was initially borrowed. Inflation-linked bonds rise in value along with Sweden’s Consumer Price Index. The interest rate is fixed for the duration of the bond, but the face value is adjusted each year for inflation. This means that, with inflation, the actual dum paid out in interest will increase even though the rate remains the same because the capital value has increased. The Debt Office pays the inflation-adjust value of the bond on maturity. The Swedish government actively pursues international traders by issuing its benchmark bonds in foreign currencies. There is no set rule about which currencies the National Debt Office will issue bonds in. Instead, the Office relies on market analysis to derive where the demand for their bonds lies. The majority of Swedish foreign currency bonds are issued in Euros and US Dollars. Although foreign traders also buy bonds in Swedish Krona, the issuance of bonds in other currencies has greatly assisted the Debt Office in attracting funds from overseas. The table below shows the involvement in the Swedish bond market by foreign traders. The National Debt Office also has a retail bond to attract the savings of the general public. The Lottery bond is a fixed-term debenture that pays interest annually. The bonds also double up as lottery tickets. This is not the Swedish National Lottery, but one run solely for the holders of the bonds. What facts should you know about Sweden's national debt? You could wrap $1 bills around the Earth 827 times with the debt amount. If you lay $1 bills on top of each other they would make a pile 23,199 km, or 14,415 miles high.